It’s spring, and the swallows have returned to Capistrano. At least, I suppose they have. They’ve certainly returned to Irvine. Swallows are hard birds to photograph! They might even be worse than those damn honeybees. They never get very close, they’re really fast, and they change direction constantly. Not only does that make them hard to follow, but even on the rare occasions when I manage to follow one for a second or two, the autofocus still needs at least a little time to lock on before the bird decides to pull a 180 and disappear. That doesn’t happen very often. But it does once in a while. 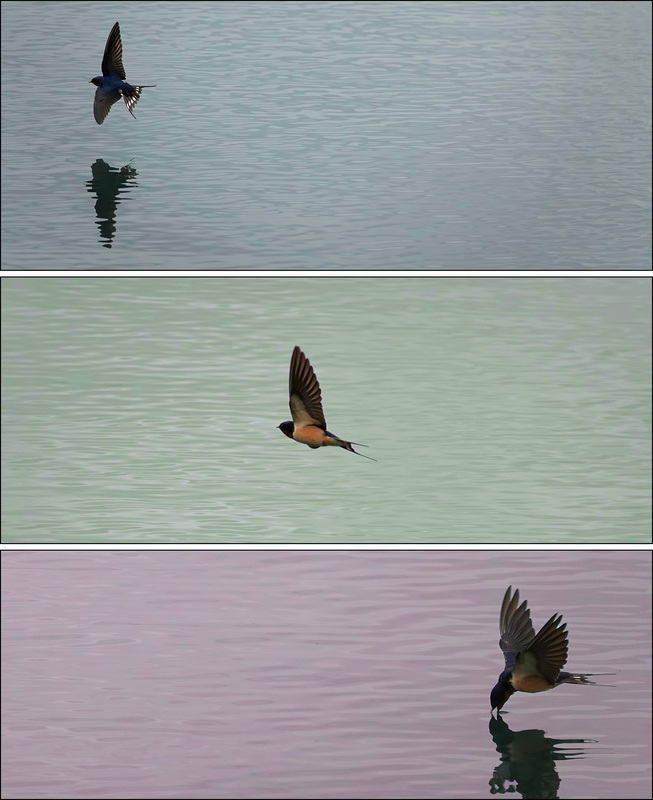 I’ve been experimenting with triptychs lately, and it works nicely with the swallows for two reasons. First, the color of the water changes depending on time of day and whether I’m shooting into or away from the sun. It’s kind of striking to see the different colors all in one place. Second, the individual photos are smaller than usual, which lets me hide the fact that they aren’t completely sharp. Except for the top one, which is really good. And the timing is really nice on the bottom one. The middle one is kind of meh, though.